The industry of chainsaws is excelling day by day, manufacturing newer and more versatile models each day. They come with different designs and set capabilities. They are utilizing innovative technology for their chainsaws. One such chainsaw is the Black & Decker NLP1800. It comes with a unique design which will definitely impress you. Although it looks different, it is no less capable compared to other models. This guide will point out all the capabilities and features of the device, its advantages and limitations, and why it could prove to be the perfect chainsaw for you. This chainsaw uses technology which ensures the reduction of the carbon footprint in your yard. This chainsaw uses a unique design which ensures maximum safety and power. A useful safety feature; the dual hand switches are to be actuated to start the machine. This is meant to prevent accidental starting. The clamping jaws design ensures that the limbs are cut in one swift motion. This machine can cut branches and logs up to 4 inches in thickness. The scissor action makes cutting really comfortable with this compact and lightweight device. Furthermore, the device is protected from damaging elements by a rugged metal guard that covers the jaws from all sides. Performance – The machine is certainly very powerful as it starts out. You can easily cut through thick branches in awkward positions. It uses a powerful 18-volt motor which ensures the device starts every time in an instant no matter what conditions. Safety – This chainsaw provided unparalleled safety to the sawyer while operating the machine. This is all thanks to the innovative design of the chain guards and dual power switches. You really can’t hurt yourself while using the machine. The chain guards and the safe design make it sure that the user would be safe no matter how tough the task and what kind of cutting is required. 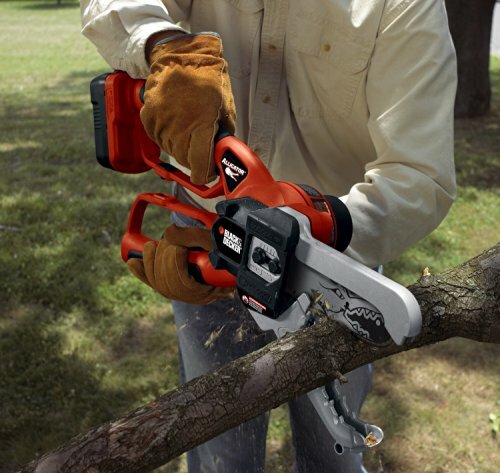 The chainsaw has the ability to withstand and serve the various cutting and pruning conditions. Pruning – The chainsaw presents the ability to cut between branches without any damage caused to the branches on the back of the chainsaw. This is a very impressive option. This has a great pruning capability, especially for overgrown hedges. This ability would help with pruning in a defined way without compromising the shape and overall look of the hedge. Operation – The device is extremely quick and swift in its operation. It cuts all branches with ease and without any inconvenience. Furthermore, it is also very quiet during the process. It is very easy to operate and does not require a lot of settings and complicated set up of the saw. Rather you can simply use it where required by just placing it onto the spot, turn it on and the job is done within minutes. Control – The Alligator gives maximum control to the user during operation. It is fairly lightweight and compact to increase maneuverability. It weighs 10.2 pounds, which is certainly manageable by most for the majority of tasks. Battery – The charging system and the battery of this device receives a lot of criticism because of under performance. What otherwise would have been an almost perfect chainsaw is obstructed by bad battery timing. There is a solution; keep a spare battery, but it isn’t a very convenient option. The battery also overheats very quickly. When that happens, the chainsaw would not perform optimally. Oiling – The machine needs to be frequently oiled while operating. Although it is certainly manageable, the manufacturers should do everything in their capability to ensure the comfort of the operator. Wear and Tear – There is also a wear problem regarding the device which can be really troublesome. The top chain guard can get in a position where it would continually rub with the chain which will create friction capable of damaging the device. This is a design flaw and should be addressed as soon as possible since it is heavily hurting the life of the chainsaw. This unique chainsaw can be used as a daily driver for light and medium duty tasks. The device is built to last, with such a design that ensures the safety of the user. It is also very comfortable to use in all styles for different tasks. That is why it should be on every home owner’s list of possible chainsaws.